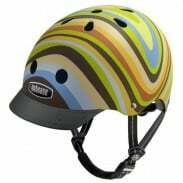 Nutcase Gold Skate Helmet – Gen 2 – Nutcase helmets comply with all appropriate country safety standards by particular sport: The function of their helmets are Multi purpose – they are designed for participating in more than one activity. For street Roller skating, inline skating, skateboarding and biking.Many great designs available, so we are sure you will find the one you love and enjoy wearing! 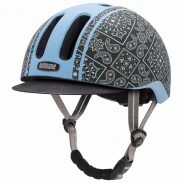 The Nutcase Street Sport Helmet gen2 - Gold Sparkle provides maximum protection, perfect fit and high wearing comfort. 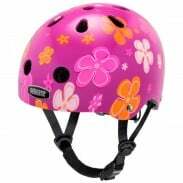 With 4 supplied cushion sizes for the perfect fit and the dial on the back of the head, can the Nutcase gen2 - Street Sport Helmet individually adapted to a head circumference of about 59 to 64 cm perfect. 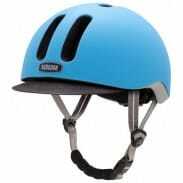 The ingenious and easy-to-use magnetic closure makes handling particularly easy: just another holding the two locks and even the helmet is securely fixed to the head. An unintentional loosening is excluded only when manually pressing the shutter will be released again. 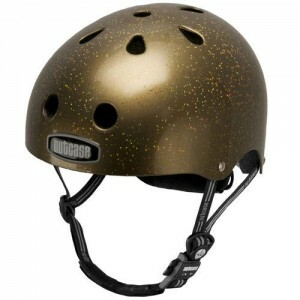 The Nutcase Street Sport Helmet gen2 - Gold Sparkle helmet is not only suitable as a bicycle helmet, but also as a helmet for Wave boarders, skaters, bikers, inline skating, mountain bikers and the like. unique, stylish top designs - i love my brain!